Did you know December is "Write To A Friend Month?" With the invention of email, texting and phones letter writing has sadly become a dead art. Yes, writing is very much an art. 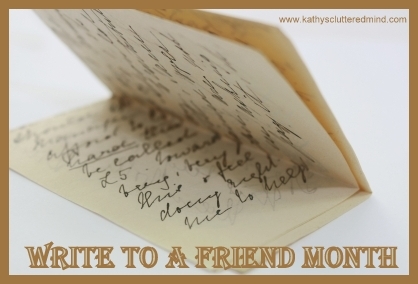 Have you ever looked at an old letter or postcard (if not dig some out I am sure you have some laying around). Letters reveal so much about a person. You can see the emotions and thought that went into writing a letter through the handwriting, words and even the state of the paper it is written on. You can tell if the writer was happy, angry or perhaps crying. You don't get any of that from an email or text. My kids (especially my daughter) love to write letters and put them in the mail. 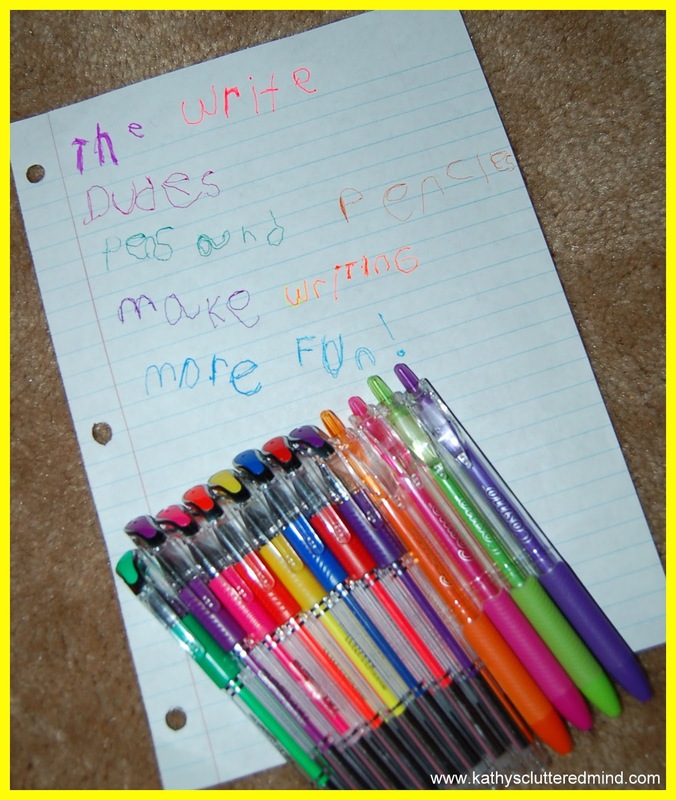 Check out this past post about making Pen Pals. Saturday the kids wrote letters to soldiers who are serving their first deployment in Afghanistan. Today they worked on making and writing cards for their friends and some residents at a nursing home. Here 10 reasons we need to encourage our kids to pick up a pen or pencil and write a letter. 1) It's a great way to teach that writing a letter requires the use of certain conventions. A letter has five parts: the heading, the greeting, the body, the closing, and the signature. 2) It's a great way to learn the concept of "audience." Not every letter you write will be written the same way. A letter to Grandma or Grandpa will not be the same as writing to your best friend, etc. 3) Letters are more personal. 4) Everyone loves getting mail (especially when it's not a bill). 5) It's a great way to practice penmanship, grammar and punctuation. 6) It allows you express your creativity. Add some drawings with your letter, write with colored pens or pencils, dot your i's with hearts. 7) Letters can be written for so many occasions and reasons: holidays, birthdays, thank you's, apologies, get well soon, congratulations, just to say hello, etc. 8) Letter writing is a very important skill to have for both young and old. 9) Its a special way to cherish memories. I have every handwritten letter anyone has ever sent me. When my brother was in the marines and overseas he wrote to me every week. I still have each and every letter. 10) Writing letters is a great exercise in expressing thoughts in words. There are some great letter writing lesson resources here. Now grab some paper and your pens, pencils and markers and introduce your kids to the lost art of letter writing. It's a great time to write a letter to spread some warm holiday cheer! 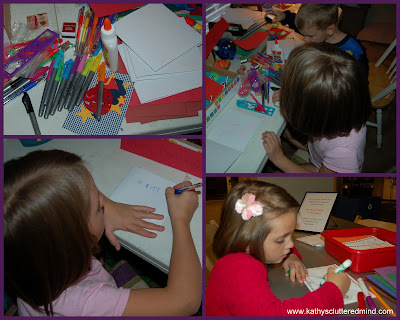 Here are some other great letter writing ideas: mail a letter to the President, mail a heart to Newtown to express your condolences and prayers for the recent tragedy in Connecticut that took the lives of several amazing children and adults. Need some fun writing utensils check out The Write Dudes. Gwyn and I are in love with our new fun vibrate colored pens. They write so nicely and they are fun too. Be sure to browse through all of our other Top 10 Posts! Thanks for stopping. *Disclaimer - Mega Brands supplied us with some awesome free pens and pencils in return for mentions on my blog and social media outlets. Many of the links found on my side bars and in my blog posts are affiliate links. Please note that prices indicated in the post are subject to change. As a result, I might get paid money and I will most likely spend the money on homeschool supplies.